A combination of features, style, and utility, the activa water heater is an excellent choice. The activa geyser is small in size and has a unique and compact design that will not take up a lot of space in your bathroom. This geyser can be installed in the master bathroom, in the children s bathroom and even in the guest bathroom. A water heater like this one not only provides you with hot water at your fingertips but also is quite easy to install and use. This quality heating appliance looks good too and it will complement the interiors of any modern bathroom. You can shop online for this activa geyser today at an affordable price some of the quality features are given below 1. Power saving insulation 2. Isi marked heating element, thermostat, and cutout 3. Heat resistant engineered abs plastic body 4. Extra heavy element for extra durability 5. Extra thick capsule type inner tank 6. Anti-vacuum system 7. Automatic thermostat 8. Power saving insulation 9. Built-in pressure release valve 10. Comes along with magnesium anode for long life in hard water 11. Exclusively 12. 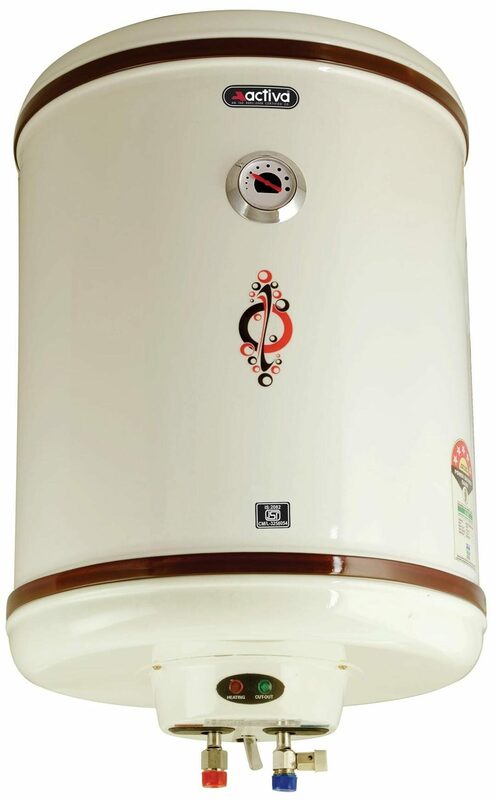 Activa geyser comes with a pure 304 l stainless steel inner tank. # The images represent actual product though color of the image and product may slightly differ.